Want to eat biryani for breakfast? Check out this old-school restaurant, SGS Non Veg – Gundu Pulav, in City Market, before noon everyday. Located in one of the alleys of Chickpet, SGS Non Veg – Gundu Pulav is an old-school joint that serves Donne Biryani. While it is no less than going through a maze to reach the place, if you use Google Maps, you will be directed here perfectly. Two-wheelers can comfortably reach the place with a bit of inconvenience, but cars are a no-no. Whatever your choice of transport, all the trouble is totally worth the biryani here. The outlet has two floors, with a kitchen and darshini like self-service set-up on the bottom floor. Upstairs, you can take your biryani and settle onto a bench, but that is only if you manage to find a seat. It is a mystery as to how this place is eternally crowded, despite being so inaccessible. 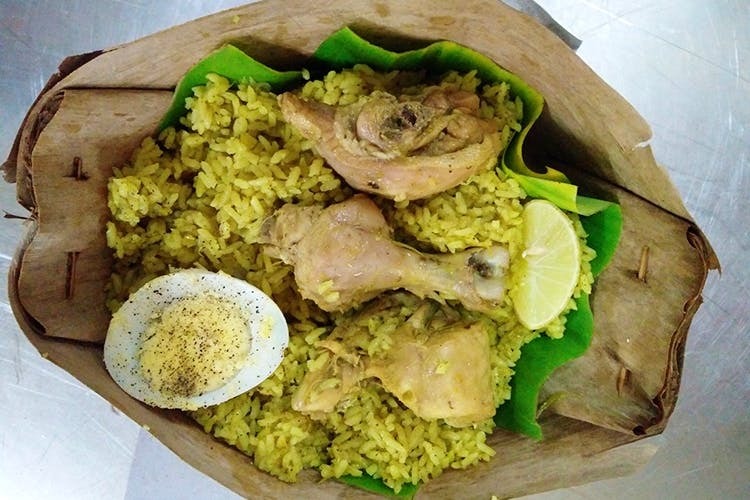 The biryani here is very different from the regular stuff made with long basmati rice, and the blend of spices makes it look yellow; in a way, it looks more like lemon rice with chicken pieces in it and is rightly called Chicken Pulao. The piping hot Chicken Pulao is served in donne with cucumbers, and topped with onion slices and half a boiled egg. For just INR 90, the quantity is good to share if you’re a small eater, or just right for a large eater to have solo. The blend of coriander leaves, mint, masala, chicken and ghee is all kinds of magic. The outlet operates from 10 am to 2 pm from Tuesday to Friday, and 8 am to noon on Sundays, or until stock lasts. They also serve Mutton Pulao on weekdays and Chicken Kshatriya in the evenings.